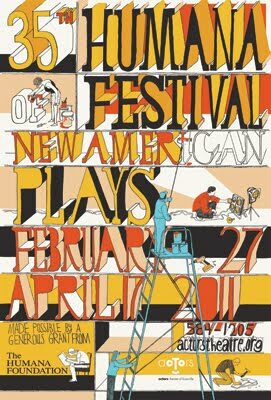 More new play festivals keep popping up, but the Humana Festival at Actors Theater of Louisville is the granddaddy of them all, created in 1976 by former Actors Theatre producing director Jon Jory. Jory himself is widely believed to be the playwright behind the "Jane Martin" pseudonym. "Jane Martin" is the author of "Keely and Du," a Pulitzer Prize nominee, as well as "Flaming Guns of the Purple Sage," "Anton in Show Business" and "Talking With..."
Three Humana plays have won Pulitzer prizes: D. L. Coburn's "The Gin Game," Beth Henley's "Crimes of the Heart," and most recently, Donald Margulies' "Dinner With Friends. "Omnium-Gatherum," by Alexandra Gersten-Vassilaros and Theresa Rebeck, and "Becky Shaw" by Gina Gionfriddo were finalists, along with "Kelly and Du." Other plays of note, like John Pielmeier's "Agnes of God," William Mastrosimone's "Extremities," John Patrick Shanley's "Danny and the Deep Blue Sea" and Richard Kalinoski's "Beast on the Moon," first found their footing at the Humana Festival. And the list of playwrights included over the years is like a Who's Who of American Theatre. There's Marsha Norman, Lanford Wilson, Shirley Lauro, Lee Blessing, Kevin Kling, Jeffrey Sweet, Horton Foote, Richard Dresser, Arthur Kopit, Steven Dietz, David Henry Hwang, Suzan-Lori Parks, José Rivera, Lynn Nottage, Regina Taylor, Tina Landau, Romulus Linney, Tony Kushner, Craig Lucas, Neena Beber, Jeffrey Hatcher, Naomi Iizuka, Tina Howe, Stephen Belber, Charles L. Mee, Naomi Wallace, Sarah Ruhl, Kia Corthron, Rinne Groff and Adam Bock. So what's on the schedule for this year's Humana Festival? A DEVIL AT NOON by Anne Washburn. "Chet writes science fiction. His book is going well but his life has jumped the outline in this engrossing exploration of the addiction, power and danger of dwelling in the imagination." See a sneak peek here and an interview with the playwright here. ELEMENO PEA by Molly Smith Metzler. "Worlds collide and sisters square off in this keenly-observed comedy about ambition, regret, and the choices that shape who we become." Click here for brief remarks from playwright Molly Smith Metzler. EDITH CAN SHOOT THINGS AND HIT THEM by A. Rey Pamatmat. "Three kids are all but abandoned on a remote farm in Middle America—until Edith shoots something she really shouldn’t shoot, and the outside world comes barging in." THE EDGE OF OUR BODIES by Adam Rapp. "Intimate and searingly honest, this play captures a young woman at the threshold of vulnerability and experience, achingly articulate about all she can’t know or control." BOB by Peter Sinn Nachtrieb. "This is a story. A story of a dream. A dream of greatness. The greatness of Bob." MAPLE AND VINE by Jordan Harrison. "When Katha and Ryu join a community of 1950s reenactors, they are surprised by what their new neighbors — and they themselves — are willing to sacrifice for happiness." See an interview with the playwright here. THE END by Dan Dietz, Jennifer Haley, Allison Moore, A. Rey Pamatmat and Marco Ramirez. "From forewarning to four horsemen, five wildly imaginative playwrights join forces with our twenty-two acting apprentices to explore the enduring promise of apocalypse — and what lies on the other side." This year's ten-minute plays are "Chicago, Sudan," written and performed by Marc Bamuthi Joseph, "Hygiene," by Gregory Hischak, and "Mr. Smitten," by Laura Eason. There's no way of knowing which of these will capture the creative imaginations of producers or directors. But it's a pretty sure bet that something will. Where else will you see ten plays in three days, with the work of some of the best playwrights, directors, designers and actors working today? Nowhere, that's where!